On 8 June 2004, you will be able to witness an astronomical event no living person has seen, a transit of Venus. This happens when the planet moves directly between the Earth and the Sun. This will only be the sixth such event since the invention of the telescope - the most recent occurred in 1882. 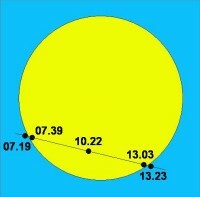 The next Venus transit will take place in June 2012 but on this occasion it will already be in progress before the Sun rises in Europe. No one living today will see the one after that, as it will not take place until 2117. Weather permitting, half of the Earth will have a view of the tiny black dot of Venus moving across the disk of the Sun (REMEMBER never to look at the Sun with unprotected eyes or through a telescope). Past transits of Venus have enabled us to discover a lot about our Solar System and the Universe. In 1716 Edmund Halley proposed that the 1761 transit of Venus should test the concept of measuring distance using 'parallax'. By observing the apparent shift in position of Venus against the background of the Sun as seen from two different places on Earth, observers could use trigonometry to calculate the distance from Earth to Venus. Kepler's Third Law of Planetary Motion allowed the distances of the planets from the Sun to be calculated from measurements of their orbital periods. By knowing the distance to Venus we could calculate the distance from Earth to the Sun. In each successive transit, scientists have made better calculations of this distance. Once the distance to the Sun was known, the distances to all of the other planets could be easily derived from our knowledge of celestial mechanics (the way things move in space) and from this, the size of the Solar System. ESA's Hipparcos mission has also measured the distance to 120 000 stars using this technique. A transit of Venus causes a tiny reduction in light from the Sun. Knowing this, by careful observation from the 1990s onwards, scientists have discovered hundreds of planets of distant stars by using highly sensitive instruments to observe tiny decreases in measured brightness.